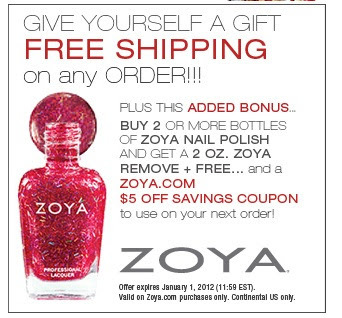 Today's post is about the offer Zoya is having on their website. It's a Free shipping offer plus some other interesting stuffs. *Coupon will be automatically generated after your order ships and will apear in the "My Coupons & Codes"section of "My Account" Coupon will expire 60 days from the time it's generated. 10 days Challenge - Day Two. 10 days Challenge - Day One. Hair news and Nail Haul.